Dark circles under the eyes can be caused by a number of factors, and determining their cause is essential to getting rid of them. Common causes include allergies, skin disorders, pigmentation irregularities and certain lifestyle choices such as drinking too much. Dark circles can also be hereditary, in which case your options are more limited. Talk to your doctor to determine whether there’s a medical cause for the circles. Ask for an allergy test and have your skin checked for eczema or other skin conditions. If you’re diagnosed with a medical problem, treating the issue will probably get rid of the dark circles as well. If you are suffering from nasal congestion, try an antihistamine first to see if clearing the congestion gets rid of the circles. Rule out iron deficiency with a blood test. 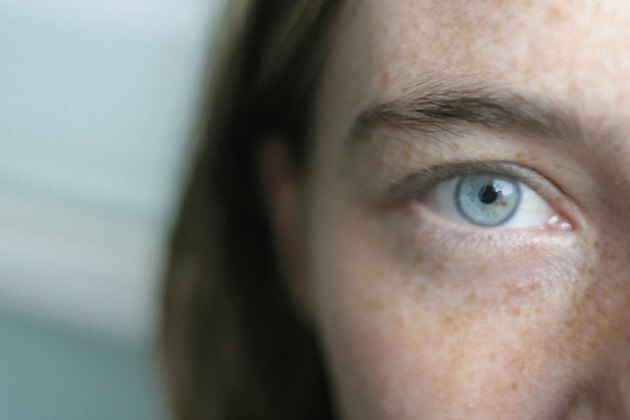 According to Yael Halaas, M.D., an iron deficiency can sometimes cause dark circles. Anemia that is caused by deficiencies in iron or other vitamins can also lead to dark circles. Your doctor will prescribe the right supplements if he determines this is your problem. Change your lifestyle. Get plenty of sleep, stay hydrated by drinking at least eight glasses of water a day and reduce the amount of alcohol and caffeinated drinks you consume. Puffy eyelids can sometimes cast shadows and make it look like you have under-eye circles when you really don’t. Also limit sodium, as this can cause fluids to pool under the eyes, causing the area to appear darker. Look into more invasive treatment, such as laser light therapy or chemical peels. These can effectively treat dark circles caused by hyperpigmentation. Laser can also help zap away superficial vessels that show through the skin and darken the area. Ask your doctor if you’re a candidate for fat transfer or dermal fillers. These procedures are used to treat dark circles that are caused by recessed spots under the eyes. As the areas hollow out, a shadow is produced, giving the appearance of dark circles. Real Simple: What Causes Dark Circles Under Your Eyes? What Causes Sudden Dark Circles Under Eyes?